Rising up above the foliage of the late blooming perennials of the August Dreams Garden border, two flowers showed up in the garden. The two blooms of Dense Blazing Star, Liatris spicata, looked as though they were advance scouts, checking out the garden to see if it would be safe to bloom there. "What do you think, DB?" "I'm not sure, but aren't those some other flowers over there across the green sea, LS?" "Yes, I think so, based on the color, but they aren't from our family. We are in the Aster family. If I'm not mistaken, those are members of the Rose family clear over there." "I think you're right, LS. I've heard they are thorny, so we'd better stay here, lest we get stuck by them." "DB, in case you hadn't noticed, we are rooted here, we aren't going anywhere." "Oh, right, LS. I almost forgot. We are definitely not tumbleweeds. They can at least roll to other places." "We are a lot better looking than a tumbleweed, too, DB. Do you think anyone will notice how we bloom from the top down rather than the bottom up like most other flower spikes?" "I hope so. It makes us unique." "And we are native flowers. This is our homeland. Anyway, what were we supposed to be doing, DB? Oh, right. We are scouting out this garden to see if we want to bloom here. So far, it looks pretty nice." "I did see a rabbit hop down that path behind us, LS, but then right after it came a gardener. That's a good sign - that there's a gardener here. I'd hate to wake up in the morning and find a rabbit nibbling on my lower leaves. Shudder to think of something so ghastly"
"Oh, don't flatter yourself, DB. I don't think that rabbit would like your lower leaves. But, yes, it is good to see a gardener here, but I wish she'd weed that path behind us. Or is it in front of us? Anyway, there are all kinds of tree seedlings in it. She needs to weed it." "I agree, LS, she definitely has some work to do in that path. You can tell her." "Me? I'm a flower. Flowers don't talk, although I've heard there is a language of flowers. Anyway, we don't talk, DB." "Oh, right, so how are we communicating now, LS, if this isn't talking?" "Beats me. Anyway, this looks like a good garden and we are the first blooms here in this border. Let's tell the others. We are going to be so pretty here." "Hey, is that a bee, LS? It is! I'm so excited. A bee. Am I old enough to know about bees?" "Yes, DB, if you are old enough to bloom, you are old enough to know about bees. Now be still and maybe a nice bee will come along and... oops, I can't say any more. Gotta keep this blog clean. Anyway, let's tell the others to bloom now, too!" HA! Good one. 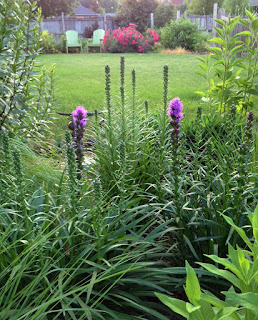 The liatris are not yet blooming here but I will listen for conversation once they start. My Liatris is almost ready to bloom! The best kind of post....informative and oh so clever! I've had these in the garden for years and recently they've decided to start spreading. Not sure why all of a sudden but I'll take it. I purchased one a few years ago that was supposed to be white, but have seen hide nor hair of it. I don't think they like my soil, I have tried a couple of times but they just die on me, thank goodness I couldn't hear what they were saying! I love all the conversations that happen in your garden. Maybe I should quietly pay more attention in mine.